Hey fitted fans all around the world, hope your day is going better than mine here in New York. Opening day is less than two weeks away, spring has officially begun, and today we have a wintery-mix of snow, rain, and slop. While you're all stuck inside the house, go over to Facebook, and join our fan page: http://www.facebook.com/pages/The-Fitted-Diaries/163305427022423?ref=ts One bit of excitement that was brought to my attention earlier was Baseball America's 2011 organizational talent rankings. If your a minor league prospect junkie like myself, it might as well be Christmas. This list give a broad overview of all 30 MLB franchises potential for this year, and seasons to come. 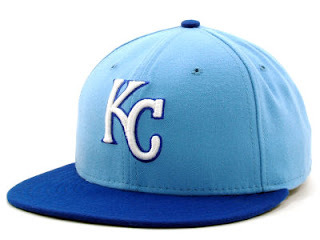 http://www.baseballamerica.com/today/prospects/rankings/organization-talent-rankings/2011/2611427.html The cap you see above this article, is the alternate 59/50 New Era cap that the Royals have worn on the field for the past few seasons. You might be asking yourselves, "whats so exciting about the boring old Kansas City Royals?" Since you've asked so politely, I'll tell you; There future! Someone asked me a few days ago to name 5 Kansas City Royals off the top of my head whom will make this years roster. Whereas I was able to do it after a few minutes of thinking, I'll admit it wasn't easy. Looking at it in a positive light, Baseball America has ranked the organization as #1 on the afore mentioned potential ranking list. Minor League Baseball recently released their top 50 prospect list for this upcoming minor league season, and within the top ten we have two huge Royals prospects. A third basemen, Mike Moustakas comes in at number seven on the list. Following him at eighth on the list, is first basemen Eric Hosmer. This is a huge foundation for the Kansas City Royals to build around for years to come if these kids can flourish and make it to the show within the next year or so. Whereas it is likely that they will finish this season, as many in the past, in the basement of the American League Central, the future overall is not so gloomy. Think of it as a 5 year plan K.C., At least you have the All-Star Game next season to start building some hype, not to mention a recently renovated stadium. Keep an eye on the boys in Royal blue this summer, don't be surprised if you see some talent star to emerge. I always like the Royals unis. The hat is hot. Check out the Twitter Page! The sister site is up! Who the hell is John Chapman? 5,000 views, and going strong! Hit the bull, win a steak.